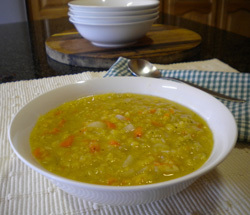 This lentil soup recipe is so amazing – both in the taste and nutrient department, but the best thing is that it cooks in 15 minutes and my children are crazy about it! I was a bit sceptical at first about creating this soup recipe because I couldn’t imagine any lentil soup being delicious, but I was so amazed at how truly scrumptious this soup is! My children love it – the whole family loves it which is fantastic because it is so incredibly quick and easy to make! It is a wonderful vegetable soup recipe that can be whipped together in thirty minutes and is so incredibly nutritious. This lentil soup is loaded with antioxidants – especially beta carotene. Lentils are particularly rich in folic acid which is essential for our good health and especially important for pregnant woman and for preventing age-related degenerative diseases. So, if you were as unsure as I was and can not imagine a lentil soup being delicious, I dare you to give it a try – you will be very pleasantly surprised! This soup also freezes fantastically well. 1. Put the olive oil, onions and garlic into a biggish pot. 2. Sweat the onions and garlic for 2 or 3 minutes. 3. Add the rest of the chopped vegetables, lentils and stock and bring to the boil. 4. Reduce the heat and simmer for 10 – 15 minutes or until the carrots are soft. 5. My children prefer it chunky, but if you like a smooth soup, once cooked, blend until lovely and smooth – or to what ever consistency you prefer. Your recipe or story becomes a whole page on this site and part of the healthy eating blog (which shows the site's most recent pages). So become a permanent part of Healthy-Family-Eating.com so others can read, learn and grow from your input! And I'll tweet your Web page at my Twitter account, too!